June 10, 2014 -- On a night when hundreds of North Shore high school, middle school, and elementary school students were recognized for their academic accomplishments during an awards presentation at this past Thursday's Board of Education meeting, Schools Superintendent Dr. Edward Melnick presented to the school board his annual Report on Student Achievement. In addition to offering data on how district students performed on standardized assessments, Dr. Melnick focused considerable attention on "authentic learning experiences" that he said promoted creativity, collaboration, critical thinking, and problem solving skills. Opening his report with a PowerPoint slide that read, "Performance-Based Learning and Assessment - What the Tests Do Not Show" - the Superintendent highlighted accomplishments that he said are not easily measured by exams. At the elementary school level, he pointed to the construction and use of the outdoor classroom by students and faculty at Glenwood Elementary as one way, among other examples, in which the district has worked to provide students with real-life, hands-on learning experiences that promote "collaboration, creativity, critical thinking and problem-solving skills;" and at the high school level - the construction of the Victorian House, the community service program, and participation in music, arts and athletics as producing similar student outcomes. Over the course of next school year, through the "Tri-States Performance Assessment Initiative," Dr. Melnick explained, students in all five of the district's schools would be engaged in projects that would require a year-long study of a particular problem or issue, that would be interdisciplinary in nature - integrating science, math, English and social studies. In September, he continued, the faculty would receive professional development is assessing desired outcomes such as creativity, problem-solving skills, engagement, and critical thinking. Transitioning to his presentation of more traditional measurements of student performance, Dr. Melnick cautioned the board and the audience that the results on the 3-8 Math and ELA assessments should be examined with the understanding that the district "was heavily into test prep last year" and that "the results ought to be read with that in mind." 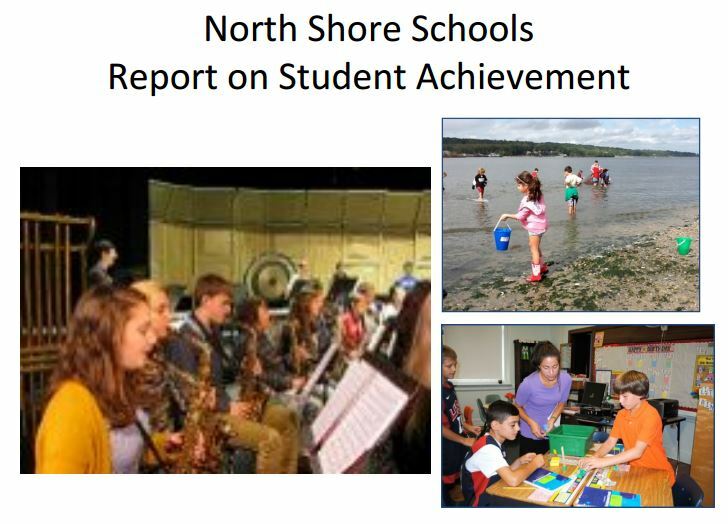 The Superintendent moved quickly through the slides showing data on the grades 3-8 assessments, on which North Shore finished in the middle or near the top of the cohort with regard to percentages of students passing or achieving mastery level. He slowed down a bit to explain some of the high school Regents exam results. With regard to the high school 9th grade Algebra scores, Dr. Melnick stated that at North Shore, all 8th graders were taking the exam, while in all but one of the cohort schools, the course was offered to 9th grade students and honors level 8th grade. Nonetheless, he said, North Shore's results were in the middle of the group in terms of percentage of students achieving "mastery level." Similarly, with regard to Geometry, he said, all North Shore 9th graders, were being compared to 10th graders and 9th grade honors students in the other districts. As for student performance on the College Board's SAT and Advanced Placement exams, Dr. Melnick presented data that showed improvement in average scores compared to past years. Although data was not shown comparing average SAT scores to the cohort of high performing districts, North Shore's average scores were significantly higher than the New York State and National averages, and while state and national averages have declined slightly over the past 15 years, North Shore's average scores showed an increase. One change Dr. Melnick said that would be made at the high school next year, is that the PSAT would now be administered to sophomores, He explained that many neighboring districts do so and he thinks that puts North Shore students at a "disadvantage." He also encouraged parents to make use of the free online prep course that the College Board now offers. With regard to the Advanced Placement exams, fewer tests were administered to North Shore students last year compared to each of the previous four years, but the percentage of students receiving 3 (the "passing" score) or higher increased to 75% from the previous year's 68%. He said that since the high school adopted its "open enrollment" policy with regard to AP exams, the percentages of students receiving 3 or higher has actually increased. As he neared the end of his presentation, Dr. Melnick returned to the theme with which he had opened, emphasizing student accomplishments in areas not measured by standardized tests - in particular, the visual arts, music and athletics - showing enrollment and participation data in art, theatre, music classes, and related extra-curricular activities. 863 students, he said, participated in 22 arts related clubs and productions. With regards to Athletics, the high school fielded 43 Varsity and JV teams last year, with 800 spots on those teams. The middle school fielded 42 teams, with 842 positions filled by student athletes. 22 Varsity teams are scholar-athlete teams, which, the Superintendent explained, means that "every member on the team had a GPA of 90 or above, and that whole team maintained that 90 or above throughout the entire season." Dr. Melnick also said that the district would "look at and continue to discuss" issues that have arisen concerning the district's Middle School sports program. He said that when a review of the Athletics program was done a number of years ago, there was a "clear desire among the community and the members of the athletics department to have a modified athletics program in the Middle School which meant no cuts in the fall and spring where we had the facilities to accommodate student interest." The result, he said, has often been multiple teams for one sport, with each team heterogeneously grouped with regard to ability. "The philosophy was," he said, "the more participation and access you had in the middle school, the greater the pool of talent as the kids come up into the high school." He continued that because many surrounding districts have cut teams and eliminated their modified programs "for budget reasons only," North Shore's modified middle school teams have not been as competitive as neighboring districts which cut athletes from rosters. Presenting a slide showing the number of county and conference championships North Shore teams won last year, Dr. Melnick explained that North Shore had not been nearly as strong in athletics in the past as it is today, and that he believes the Middle School modified sports program has played a big role in "creating the pool of talent that goes into these championship teams." During the board discussion following the presentation, Trustee Michael Nightengale asked whether the issue of having mixed ability teams at the Middle School level would be looked into, and suggested a full review of the athletics program. Dr. Melnick replied that as a result of the last comprehensive review (done in 2003), it was recommended that a modified sports program be adopted at the middle school level, and that that would provide a foundation for creating a very competitive high school program. He said that the review was very "labor intensive and costly." Trustee Amy Beyer added that it would be a good idea for the board, if they did choose to review the program, to identify specifically what areas ought to be examined, because the previous review was a "very comprehensive," "time intensive and expensive" one. Dr. Melnick said that he would provide the trustees with a copy of that review. The Superintendent concluded his presentation saying that the district's goal in the elementary schools is to do less test prep, but at the secondary level, because the regents and AP exams are exit exams and necessary for entry into college, the philosophy was a little bit different in that there would be efforts to prepare students for success on those assessments. The district, he said, would be moving more in the "direction of performance based assessment and interdisciplinary learning" and to "foster the skills of critical thinking, collaboration, creativity, engagement, and entrepreneurship. Click Here or on Image for link to Student Achievement Slide Show presented at June 5 Meeting.